20130510 + Up and to work. Quiet day so got caught up on a lot. Mike brought his daughters Brittney and Briana. Very nice girls getting to see where their dad works. Storms came rolling through and I got the dreaded call that our baseball game was cancelled :-( This was to be our last game and I was disappointed and knew the boys would be too... 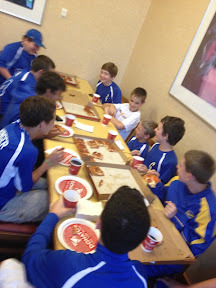 So with a bit of cash left in the baseball budget we moved the game inside to Donatos and had a pizza party instead. I presented the two players that did not get a game ball during the season with one, and then the boys presented a shiny new baseball they had all signed to their hard working and faithful Bat Boy. G smiled so big it must have hurt his face :-) The boys went around and told their favorite play and part of the season and had a great time!